Michael Wejchert, Alden Pellett and I are on our way to Newfoundland for nine days. I've always been inexorably drawn to northern maritime areas. The juxtaposition of mountains and oceans in maritime Canada is beautiful. Our overnight ferry yesterday from North Sydney, Nova Scotia was cancelled due to extreme wind (up to 110 mph! ). 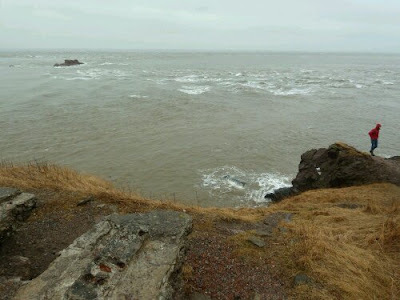 We decided to take a short detour to view some of the seaside climbing in St. Martin, NB, on the Bay of Fundy. Despite the rain, which prevented us from climbing, the area was worth visiting. All of us agreed we would like to climb there in the future. We can't remember a time when climbing wasn't life. From dark, snowy predawn starts and the scraping of crampons on rock to sunset atop one of the many fine New England crags, we enjoy it all. Our goal is to share our love of the outdoors and climbing with you, while providing a rewarding and memorable outdoor experience. We offer daily rock climbing and ice climbing outings in New England and New York and frequently offer trips further afield to areas like Red Rocks and the North Cascades.